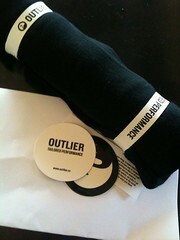 In September, I talked about our meeting with Outlier Clothing and the preview they gave us of their goods. Well, they were nice enough to send me an Empire Merino Tee and I’m here to tell you: it’s nice. For starters, unlike a lot of merino, this t-shirt is soft. I don’t mean soft like “less scratchy,” I mean soft like “you won’t be aware you’re wearing wool.” Ibex made me realize that wool could be a no-fuss, super comfortable and hard-wearing technical and everyday fabric, and their Shak jersey remains one of my favorite pieces for its toughness, versatility, and stink resistance. But I want to ensconce myself in the fabric from Outlier’s Empire Tee. It’s soft and luxurious without being fussy. What I especially like is that this is an everyday t-shirt. It fits like a regular t-shirt–no funky flat seams, weird panels, or sporty logos. James Dean would could’ve worn this, and it’s obvious that Outlier intended it that way. I love gear as much as the next guy, but sometimes I want to put on a functional piece of clothing without looking like an extra from ST:TNG, and in this case, the Empire Tee could easily go solo on a hiking trip, or add a little punk elegance under a suit jacket or blazer. The fit is similar to American Apparel tees, but a little roomier. I normally wear a medium American Apparel, and a 38-40 jacket. The size medium Outlier Empire Tee is just a little larger than I prefer and is long, like American Apparel t-shirts. I suspect I would have preferred a small since I wear my t-shirts slightly more fitted, but the medium is working out fine. I’ve also had a chance to put it through several wash/dry cycles and it’s holding up really well. I followed the instructions (wash warm, dry low) and the t-shirt maintains its shape and fit while staying soft. At $75, this is a spendy t-shirt, but I have a feeling I’ll be wearing it a long time in lots of situations. If it holds up anything like some of the other performance merino I own, then it qualifies as a wardrobe investment.